A few months ago, I publicly challenged Mayor Greg Ballard's overt pandering to the Simon-owned Indiana Pacers, which contribute very little to the local economy compared to the Indianapolis Motor Speedway. I asked Mayor Ballard in front of the Washington Township Republican Club if he was even aware of what was taking place out at the IMS and the long-term economic impact its downward spiral could have on the local economy. A red-faced Ballard dismissed the concerns I raised and said the IMS was doing just fine. Ballard's only interest in the IMS is how he can personally gain from it, including plenty of free tickets and feasting on buffets in the corporate suites. He planned another one of several overseas junkets he has taken since becoming mayor around an inaugural IRL race in Brazil earlier this year. Motorsports insiders think the Brickyard 400’s declining fortunes will hasten the Hulman-George family’s decision on the future of the Indy Racing League, which the NASCAR race has helped subsidize. “It’s a strong event for us,” he said. Few dispute that, but racing analysts now think the IRL’s losses exceed the Brickyard 400’s profit, and that could be a major rub for the board that controls the Indianapolis Motor Speedway and IRL. Since the IRL’s inception in 1996, the board, which is four-fifths Hulman-George family members, has used Brickyard 400 profits to support the open-wheel series. But now the Brickyard’s raging revenue stream has slowed considerably. A feud among board members over money following the 2009 Indianapolis 500 led to the departure of former IMS and IRL boss Tony George. Now there’s speculation the diminished financial firepower of the Brickyard 400 could lead to other changes. “The balance sheet is what led to Tony George’s ouster, so you know the balance sheet has [the board's] attention,” said Zak Brown, president of Just Marketing International, a local firm that represents some of the biggest sponsors in motorsports. Most with knowledge of Speedway finances think that amount is directly related to what the Brickyard 400 generates in profit. Schoettle cites experts who estimate the IRL has lost a staggering $400 million since its inception in 1996. "Sources close to the IRL said the series lost $22 million in 2009 and is headed for another eight-figure loss this year, he writes. "IRL officials have cut $2 million in overhead in the last year, have raised $3 million in cash annually with a new title sponsorship deal with Izod, and tallied $2 million in profits from the series’ popular Brazil race, said motorsports business experts." "That still leaves a $15 million hole to close." The financial impact of the IMS on the local economy dwarfs any benefit derived from Herb Simon's Indiana Pacers. Yet we continue to subsidize the billionaire Simon tens of millions of dollars annually, while the Hulman-George family has never received any public subsidies for the IMS, which they own and maintain at their expense and pay property taxes on. To my knowledge, the Hulman-George family has never asked for a public handout from taxpayers either. Instead of wasting our money on the Pacers, Mayor Ballard should be paying more attention to what is happening at 16th & Georgetown Road. The Indiana Law Blog has done an incredible public benefit in its in depth reporting during the selection process of our state's next Supreme Court justice, far surpassing any reporting I've seen in the mainstream media. Prior to the Indiana Judicial Nominating Commission's review of the nine finalists for the position, the blog performed an analysis of how well the judge candidates' decisions at the trial court level had fared on review by the state's Court of Appeals and the Supreme Court. "As a general point of reference, over the past five years approximately 22% of cases have been reversed or remanded on appeal," the blog found. The likelihood of reversal in criminal cases was higher than civil cases according to the blog. "Indigent criminal defendants have an automatic right to appeal at no cost, and the reversal rate is typically around 15%. Civil litigants, who must generally pay the expense of an appeal, pursue appeals less frequently and are more successful with a 37% reversal rate," the blog continued. Of the four judges who made the list of nine finalists, Hamilton Superior Court Judge Steven Nation fared the worst with a reversal rate of 35%, followed by Johnson Superior Court Judge Cynthia Emkes with a reversal rate of 33%. Boone Circuit Judge Steve David fared the best among the four judges considered by the Commission this week for the position. His reversal rate was just 18%. Its analysis found that Marion Co. Superior Court Judge Robyn Moberly has been reversed in 28% of her cases reviewed by higher courts. Judge David has had 33 cases in total reviewed by higher courts compared to 71 of Judge Moberly's cases that were challenged. In a 2007 case involving the murder of a Gary police officer, the only criminal case decided by Judge David that was reversed by a higher court, the Supreme Court reversed his decision to impose the death penalty after two prior trials had found the defendant guilty, citing the constitutional failure of the defendant to receive a speedy trial and his right to due process. Judge David has had just five of his civil cases reversed and all were decided by the Court of Appeals. Judge Moberly has seen four of her cases reversed by the Supreme Court, including three civil cases and one criminal case. In the criminal case, the Supreme Court found that Judge Moberly "clearly erred by failing to instruct the jury on the specific intent necessary to establish accomplice liability for attempted murder." Judge Moberly saw 13 of her civil cases reversed by the Indiana Court of Appeals compared to three cases in which her criminal cases were reversed by the Court of Appeals. In a 2002 case, the Court of Appeals determined that Judge Moberly had erred in permitted evidence of a defendant's criminal propensity in his trial on molestation charges, finding that its negligible probative value far outweighed the likelihood of unfair prejudice to the defendant. Judge David is obviously well-liked and respected by trial judges throughout the state, and every lawyer I know who has appeared before him has had very positive things to say. His work overseeing the delivery of pro bono services to detainees at Guantanamo Bay speaks volumes about a commitment to justice for all. I’ve known Judge Moberly for several years through my work directing the law school’s Court Externship program, and she has been a wonderful mentor to law students and exceedingly gracious with her time when I’ve taken students to the City-County Building to see the courts and when she came to the law school to hold an oral argument. The breadth and depth of her experience on the bench (and in practice before that) will serve us very well if she is appointed. Finally, I’ve known Karl for several years through the Appellate Practice section of the state bar. He knows as much about the Court and appellate process as anyone, yet he could not be more humble and gracious. Although his practice has involved a lot of complex civil cases, the answers during his interview demonstrate knowledge about and a commitment to a wide range of other issues--and concern for a fair process for all. The Governor could not go wrong with any of these three remarkable finalists. The Indiana Judicial Nominating Commission has agreed on three distinguished candidates to forward to Gov. Mitch Daniels from which to choose for the Supreme Court vacancy created by the departure of Justice Ted Boehm. The three are appellate attorney and former Supreme Court administrator Karl Mulvaney, Marion Co. Superior Court Judge Robyn Moberly and Boone Co. Circuit Judge Steven David. Because there are no women currently on the court presently, the presumption is that Gov. Daniels will choose Moberly because she is the only female candidate. Some are less than pleased that among the 19 orignal female applicants who applied for the job, only one made the final cut. I think there are many observers who are surprised Ellen Boshkoff of Baker & Daniels didn't make the cut. She was the smartest in the group of nine finalists based on grades. The Indiana Law Blog has a good summary of the finalists' interviews before the Commission here, here and here. There's plenty more information there if you want to learn more about the finalists. Personally, I think Mulvaney is the best choice hands down among the three finalists, but I'm afraid his gender may be a hindrance to his chances. Did We Hit A Raw Nerve? Several IBJ readers recently asked about the economic impact of the Indiana Pacers. One wanted a comparison between the Pacers and Indianapolis Indians. The city recently commissioned a study—done by Chicago area consultant Rob Hunden—which found that the Pacers have $55 million annual economic impact on Indianapolis. Mayor Greg Ballard used that economic impact as justification for paying $33.5 million over the next three years for Conseco Fieldhouse operations expenses as well as $3.5 million in capital improvements. The reason the comparison is interesting is because the Pacers and Indians bring about the same number of people downtown each year. Last year, the Pacers total attendance for 41 regular season games was 582,295. For 72 home games, the Indians are on target to draw near 600,000 this season. Last year, the team drew about 550,000 fans to the home games despite lots of rain. In 2008, the team drew 606,166. The other reason the comparison is interesting is because the Indians pay to play in Victory Field and pay for all the upkeep of the place to boot. The Indians too commissioned an economic impact study—in 2007. That study—done by Strategic Marketing and Research Inc.—found that the Indians brought $28 million in spending downtown annually. So why the disparity? . . .
Do the Indians draw as many people downtown as the Pacers and Colts? Yes. Money, though, is another kettle of fish. As for the value that each team brings the city, that’s another debate entirely. Schoettle then goes on to explain how ticket prices, corporate entertaining and concessions for Pacers games are considerably higher than Indians games to explain why the economic impact of the Indians is about $28 million annually versus $55 million for the Pacers. But as he notes, the Indians are paying the CIB to play at CIB and pay for all of the operating and maintenance expenses on Victory Field and still manage to turn a profit. The Pacers claim they are losing tens of millions of dollars a year despite their rent-free use of Conseco Fieldhouse and getting to keep all of the revenues for both game and non-game events, but for obvious reasons, won't open up their financial statements for public scrutiny, unlike the Indians who annually report their financial statements to shareholders. I would actually dispute the $55 million economic impact number that flawed study the CIB manufactured to promote the $33.5 million give-away to Herb Simon. It seems to me that the Indians tend to draw families, who often come from out-of-town and stay overnight in hotels and take in other downtown attractions during their visit to Indianapolis, unlike Pacer fans, who drive in and out of the games with few staying overnight or dining at restaurants downtown. It's obviously a debate in which the CIB and the downtown elites, however, don't really want to engage. I continue to dispute Herb Simon's claim that the team has been losing tens of millions of dollars a year. I believe the public has a right to be skeptical, particularly when they won't publicly disclose the franchise's financial statements. We're also not being told what Herb Simon paid this past year to buy out his late brother Mel's 50% stake in the franchise. How much is an NBA franchise that is losing so much money worth? It's entirely relevant, but the corrupt leadership of the CIB made damn sure we won't know the truth. I find it particularly telling that sister-in-law Bren Simon said of Herb Simon during her deposition over the case disputing the validity of a will her late husband supposedly executed giving her a larger share of his estate that he speaks out of both sides of his mouth. Yeah, he tells us he's losing tens of millions of dollars, while he and his wife continue to lead a very lavish lifestyle out in California. I'm sure Jim Morris has been well compensated by the Simons for pulling off yet another fraud on the taxpayers of Marion County. It wasn't enough that he convinced the City to pay double what the water company was actually worth and then walked away with an $8 million golden parachute. He had to come out of retirement to bag another haul. Metro Police made two gang arrests related to the shootings downtown during the Black Expo Summer Celebration. One of the suspects is a woman who works at the Marion County Jail. The other is her teenaged son. Police found gang paraphernalia in the suspects' home. The gunfire that wounded nine people during Black Expo weekend was gang-related, according to Metro Police. Shamus Patton, 17, faces charges in the downtown shootings. Tuesday, police arrested 34-year-old Michelle Hurns, an employee of CCA, the private company that runs the Marion County Jail 2 and her 16-year-old son on charges that include criminal gang activity. IMPD's gang unit discovered gang paraphernalia, cell phones, a computer and bullets at her home on the southeast side. Among the items seized from the home was a Grimmie Boyz T-shirt. "She was either a member of that gang or supported her son in that gang," said Sgt. Linda Jackson, IMPD. The Grimmie Boyz is a criminal gang active in Indianapolis that police believe was the apparent target by Shamus Patton, an alleged member of a rival gang called the Ratchet Boys. Police believe Hurns' son was a witness to the downtown shooting. Authorities say the teen and his mother fought with police during Tuesday's arrest. It is important to note that Michelle Hurns is an employee of the private operator of Jail II, Corrections Corporation of America, and not the sheriff's department. Hurns works in the intake area of the jail. It is very disturbing that steps are not taken to monitor the employees working for the private contractor more closely. This kind of personnel breakdown at the jail opens the opportunity for contraband to make its way into the jail. WTHR's report indicates Hurns was verbally abusive and resisted arrest. She's been charged with criminal gang activity, resisting arrest and obstruction of justice. Her 16-year-old son is facing similar charges in juvenile court. Earlier reports indicated there was an attempt by Hurns' son to incite a riot in their neighborhood when police were taking them into custody. This seems to be a pattern provoked following the alleged beating by police of a youth who attempted to interfere with the arrest of his younger brother on home invasion charges. We're really sitting on a powder keg here in Indianapolis with racial tensions running high and police feeling their hands are now tied to effectively combat crime in the City because of the egg-headed leadership of New Yorker Frank Straub. Reports I'm getting about the policing downtown on the night of the shootings confirms that. Despite a presence of 500 police officers, business owners complain that police did nothing to curtail bad behavior. According to one account, one business owner had to watch while youths destroyed property at his restaurant while police looked on and refused to stop them, even after the business owner appealed for help. That's because they were under orders by Straub to avoid making any arrests in an abundance of caution to avoid offending the African-American community. The teens quickly surmised that the huge police presence posed no threat to carrying out serious crimes, such as the shootings that occurred. While police patted themselves on the back for capturing Shamus Patton after two days on the lam, others including me are not impressed. The second shooter has never been identified by police. Patton fired off numerous rounds at two different locations where there was a large presence of police on foot, on horseback, bikes and riding in cruisers. That he was able to fire shots is no surprise. That police couldn't apprehend him before he escaped is inexcusable. That Patton, who had faced nine previous criminal charges over the past two years, including a search warrant two months ago that uncovered evidence of his criminal gang activity and was still on the streets instead of locked up in the juvenile offender center is an outrage. One final note on Straub. During a meeting this summer with a group of black ministers at a church, I'm told by an administration official that Straub repeatedly dropped the f-bomb during his presentation. The ministers were none too pleased with his foul language. I'm told Straub was oblivious to the idea that anyone would have been offended by him using the f-word. It is interesting that Straub's faux pas has been completely ignored by the news media, some of whom I know have been made aware of it happening. I guess it doesn't fit the meme that Straub is an intellectually superior east coaster among the rubes that is helping us find our way out of the dark ages. In a unanimous vote, the Lawrence Advisory Board passed a resolution to merge, a move that drew applause from the crowd. More than 100 firefighters would be affected if the measure received final approval. Very excited, long time coming," said Lawrence Township Fire Chief Michael Blackwell. Under the consolidation plan, 18 of 127 firefighters would remain with the city of Lawrence with the rest rolling into IFD. Lawrence Township firefighters were facing layoffs and took a 16 percent pay cut this year. Financial woes would go away if the merger goes through. "They'll see a significant pay increase and a pension base increase," Blackwell said. Supporters contend that consolidation saves taxpayers money by sharing services. Trustee Russ Brown said there would be a slight cost increase the first year but that the decrease would be significant in the following years – about $150 on property tax bills. IFD officials said consolidation brings enhanced fire safety and cuts duplication that already results in the two departments responding to the same runs. Did you catch that? "They'll see a significant pay increase and a pension increase." That's the basic problem with all of these mergers. IFD absorbs firefighters from the townships and boosts their pay and pension benefits considerably to match those of IFD's firefighters. Lawrence Township Trustee Russ Brown notes the higher taxes property owners will pay the first year, but he assures us the property tax bills will decrease by about $150 on average in subsequent years. Is he talking about Lawrence Township ratepayers or Marion County ratepayers? Yeah, that's what I thought? He's talking about Lawrence Township ratepayers. Unfunded pension liability for public safety employees is what got Indianapolis into deep trouble before the state agreed to pick up about a half billion dollars in pension debt during the first part of the Ballard administration as part of a property tax reform plan that required all taxpayers to pay a higher state sales tax as a tradeoff for tax caps. Every time IFD absorbs another one of these township fire departments, it means the IFD taxing district will be paying more over the long haul to make up the difference in extra pay and pension benefits for those added firefighters, not to mention the cost of maintaining services in the primary areas of the county experiencing real growth. That translates into the need to raise property tax rates or find the money elsewhere in the city-county budget if the property tax cap law won't allow the fire district to raise the amount needed to pay for these expanded services. It's just more "Alice in Wonderland" fantasies. And we fall for it every time. While years have gone by since the Indianapolis U.S. Attorney's Office first received evidence from a whistle blower accusing businessman Tim Durham of running a Ponzi scheme and engaging in securities violations, there have still been no criminal charges brought against him. This delay continues to occur despite the fact that federal investigators finally raided his businesses eight months ago and his Fair Finance Company has been forced into bankruptcy, taking investors for at least $200 million in losses because Durham loaned the investors' money to companies he owned and never repaid the loans. Durham lived a lavish lifestyle with mansions, yachts, jet airplanes and a vast collection of pricey cars that has been recounted in numerous news reports in recent years. Durham also helped bankroll numerous politicians' campaigns, including Gov. Mitch Daniels and Marion Co. 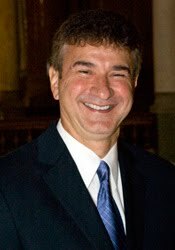 Prosecutor Carl Brizzi. Yesterday, we learned that our U.S. Attorney's Office in Indianapolis had a more pressing case on which to work. "A federal grand jury in Indianapolis indicted [Rev. Wayne] Harris, 36, this month on two counts of wire fraud," the Star reports. "Convictions could bring a maximum 40-year prison sentence and a $500,000 fine, prosecutors said." According to the Star, "[f]ederal authorities say Harris, the son of a prominent late Indianapolis pastor, skipped out on [a $500,000] loan [to build a church] and moved to Texas after spending about $145,000 on a Mercedes-Benz, a mink coat and a Christian bookstore and its inventory." I'm glad to see our U.S. Attorney's office has time to bring the good reverend to justice, if not the much bigger fish, Tim Durham. Maybe if Rev. Harris had spread some of his bootie around to the politicians, he would still be a free man like Durham. The 7th Circuit Court of Appeals today issued an opinion upholding a judgment in favor of former Chief Deputy Coroner John Linehan in his race discrimination claim against the Marion County Coroner's Office during the troubling one-term tenure of Kenneth Ackles. The Court, however, remanded the case for further review of the compensatory damage award of $200,000, finding it was excessive. An administrative law judge for the EEOC found in Linehan's favor previously and awarded him his lost wages and compensatory damages. On appeal, the EEOC in Washington affirmed the ALJ's opinion in full and the Marion County Coroner's Office appealed the decision to the 7th Circuit Court of Appeals. I'll update with more information later. Hat tip to the Indiana Law Blog. UPDATE: Here's a factual summary of the case discussed in today's decision by the three judge panel. In November 2004, Ackles, a chiropractor by trade, was elected coroner. At that time, Linehan and Alfarena Ballew, an African-American deputy coroner, both sought the position of chief deputy coroner. Ackles chose Linehan for the job because he was currently serving as the interim chief deputy, and Ackles wanted to maintain continuity in the office. Ackles and Linehan were sworn in as coroner and chief deputy coroner, respectively, in January 2005. Soon after, Ackles met with Linehan to discuss his (Ackles’) agenda. During their conversation, Ackles said that he “really needed to find a way to get more African-Americans into the Coroner’s Office,” especially as deputies. Ackles asked Linehan to determine how to execute this plan. Linehan contacted the city’s legal office and learned that deputy coroners could not be removed without cause. Nevertheless, a city/county council member who had been on Ackles’ campaign committee regularly sent Linehan resumes and encouraged him to hire more African-American staff . . . In June or July 2005, Linehan recommended disciplining Ballew for multiple performance issues. On one occasion, it took Ballew over an hour to arrive at the scene of a homicide, although office policy required that she respond within thirty minutes. During her absence, the victim was left lying in the street, with her friends and family watching. On another occasion, Ballew took more than two hours to arrive at a hospital where a child was dying. The family wanted to donate the child’s organs, but because Ballew arrived late, the organs were no longer usable. On that occasion, Linehan offered to send another deputy, but Ballew assured him that she would be “right there.” Despite these incidents, Ackles told Linehan not to discipline Ballew. Ballew’s problems continued the next month when, despite arriving thirty minutes late for a mandatory staff meeting, she prepared a time sheet indicating that she had arrived on time. Linehan wanted to discipline Ballew, but Ackles once again stopped him from filing a written report. When Ballew continued to arrive late to meetings and crime scenes, however, Linehan prepared a written reprimand with the assistance of the human resources office (and without Ackles’ knowledge). Linehan later testified that he normally did not submit proposed disciplinary actions to the coroner for approval. He did so initially in Ballew’s case, however, to avoid the appearance of bias, as she had applied for the position of chief deputy coroner. Shortly thereafter, an anonymous letter was sent to members of the city/county council accusing Linehan of "double dipping” or “ghost employment”—that is, billing the coroner’s office for time spent working elsewhere. Indeed, Linehan was working as a paramedic on his days off. But outside employment was permitted, and Linehan had previously disclosed this information. In response to Ackles’ questions about the letter, Linehan gave him written documentation demonstrating the validity of his hours. Ballew later admitted to authoring the anonymous letter . . . In early November 2005, Ballew failed to attend another mandatory meeting. When Linehan confronted her, Ballew yelled at him, called him a liar, threatened him, and accused him of mistreating African-American staff. Ballew also claimed that she had received permission from Ackles to skip the meeting. Linehan attempted to contact Ackles but was unable to reach him. When Linehan finally spoke to Ackles, he had already discussed the matter with Ballew. Ackles told Linehan that he could no longer discipline Ballew without his (Ackles’) permission. Troubled by the incident, on November 14, 2005, Linehan filed a complaint with the human resources office, alleging a hostile work environment. Later that day, Ackles told Linehan that he was “going to make a change in chief deputies” but did not provide an explanation. During the same conversation, and on several other occasions, Ackles told Linehan to get his hostile work environment complaint “taken care of.” Ackles also said that he wanted a smooth transition to the next chief deputy coroner and that Linehan was to continue performing his duties until the transition occurred. Linehan continued to receive the same pay, although he was stripped of responsibility for supervising employees. The office staff were later informed that Linehan would no longer be chief deputy coroner. They were told to consult Keith Conaway, a white deputy coroner, regarding runs and Ballew regarding death certificates. Linehan’s understanding was that he would become a deputy coroner once he was removed as chief deputy. Linehan subsequently left on a previously scheduled vacation. Just prior to his departure, he received a call from a reporter about an investigation into the ghost employment allegations. Linehan called the city’s legal office, but it too was unaware of any investigation. While he was away, however, a news story came out quoting Ackles as saying that Linehan was being investigated. Upon returning to work, Linehan discussed the ghost employment allegations with Ackles and expressed disappointment that he told the media about a nonexistent investigation. Linehan also discovered papers in his office left by Ballew, including a list of tasks she intended to undertake as chief deputy coroner, a plan to review the office’s pathology contract, and a copy of the anonymous letter accusing Linehan of ghost employment. On December 2, 2005, Linehan received a letter from Ackles terminating his employment . . .
Conaway took over Linehan’s duties on an interim basis. A few weeks later, however, Ackles named Ballew as Linehan’s permanent replacement . . . The EEOC determined that Ackles’ stated reason for taking action against Linehan—namely, that Ackles had “lost confidence and trust” in Linehan—was pretextual. Substantial evidence supports this finding. For example, Ackles testified that he lost confidence and trust in Linehan because he was “nit-picking” certain employees, including Ballew and the janitor. Putting aside the fact that Ackles’ so-called disagreements with Linehan about Ballew were the very basis for Linehan’s race discrimination claim, a wealth of evidence supported Linehan’s decision to discipline her, which he did only once. Furthermore, Ackles admitted that Linehan did not have the ability to fire employees, casting doubt on Ackles’ assertion that he feared Linehan would terminate Ballew. And as for the janitor, the evidence showed that Linehan found missing property in the janitor’s closet. Ackles himself acknowledged that, under those circumstances, it would be proper to discipline the janitor. The EEOC therefore could have reasonably found that these reasons were insufficient to motivate the employment action. Relatedly, the coroner’s office also claims that Ackles disapproved of Linehan’s handling of the investigation into the missing funds. As we pointed out at oral argument, however, it is hard to see how Linehan’s handling of the investigation—which included contacting the city’s legal office and following its instructions to file a police report—could be worthy of disapproval . . .
Ackles also testified that he was dissatisfied with Linehan’s raise. The EEOC found his testimony incredible, however, because Ackles reviewed the budget providing for the raise when he was elected. Moreover, as Ackles knew, Linehan prepared the budget when he was serving as the interim chief deputy coroner. At that time, Linehan could not have known that he would be in the position of chief deputy coroner the following year . . . The point is that there was enough evidence to demonstrate that Ackles’ stated reason for taking action against Linehan was pretextual. Ackles’ lack of credibility, combined with his stated preference for employing African-Americans and his actions taken in furtherance of that goal, was sufficient for the EEOC to find that Linehan was subjected to race discrimination. The final issue is whether the compensatory damage award of $200,000 was acceptable. In reviewing these determinations, we typically ask: (1) whether the award is “monstrously excessive”; (2) whether there is no rational connection between the award and the evidence; and (3) whether the award is comparable to those in similar cases. Fox v. Hayes, 600 F.3d 819, 845 (7th Cir. 2010). “An award for nonpecuniary loss can be supported, in certain circumstances, solely by a plaintiff’s testimony about his or her emotional distress.” Tullis v. Townley Engineering & Manufacturing Co., Inc., 243 F.3d 1058, 1068 (7th Cir. 2001). That said, the evidence here does not come close to supporting the $200,000 award for compensatory damages. The testimony on Linehan’s suffering was extremely brief and only indicated that Linehan had undergone “[w]eekly” therapy sessions for “[s]everal months” for “[s]ituational depression.” Nor are the underlying facts of Linehan’s case—to sum up, he was fired from a political post because of his race and in retaliation for filing an internal complaint after a few verbal altercations with his superior—so extraordinary as to warrant such an award. Cf. Neal v. Honeywell, Inc., 191 F.3d 827, 832 (7th Cir. 1999) . . . When asked at oral argument what Linehan’s award should be, the coroner’s office’s counsel replied, “Zero.” While we agree that the amount is excessive under the circumstances, surely some measure of compensatory damages for emotional distress is warranted. Based on our review of the evidence and comparable cases, we believe that a remittitur to $20,000 would keep the award within rational limits. If the respondents do not consent to the remittitur, there will be a new hearing on the issue. For the foregoing reasons, the petition for review is DENIED IN PART and GRANTED IN PART. The compensatory damages award is VACATED, and the matter is REMANDED to the EEOC for proceedings consistent with this opinion. In the interest of disclosure, I have represented several plaintiffs in race discrimination claims against the Marion County Coroner's office, along with my co-counsel, Jeff McQuary. Two of those cases brought by former employees were settled by the coroner's office for $100,000. A third case involves the former forensic pathology firm and the doctor-owners of that firm. Judge William Lawrence dismissed that case on the Coroner's Office motion for summary judgment, and the case has been appealed to the 7th Circuit Court of Appeals where it is currently pending. To see my earlier post on the EEOC decision, click here. To see my earlier post on the ALJ's decision, click here. Late last September, the Indianapolis Indians stared down the barrel of financial disaster. Following the 2009 season, three-fourths of the team’s sponsorship deals expired, giving the Indians a tough challenge in an economic climate that’s enough to make just about any sports business administrator hit the panic button. But Indians officials stood in the batter’s box, dug in their cleats, and didn’t blink. Instead, the team’s front office rolled up their sleeves and went to work. The Indians re-signed the vast majority of those sponsors and enough new ones to increase sponsorship sales $200,000 over last year, an increase of more than 10 percent. New sponsors include Firestone, Mike’s Express Car Wash, Buffalo Wings & Rings, Frito-Lay and Sharp Business Solutions. Schoettle's story notes the success the Indians have achieved from installing a $600,000 video board near the left field wall that has helped boost sponsorship revenues. “That’s smart business,” said Rick Horrow, president of Horrow Sports Ventures, a Miami-based sports marketing consultancy. “That’s how smart sports business operators are making it in this economy. Not only making cuts where needed, but making strategic investments that will pay real dividends.” By contrast, billionaire Herb Simon is forcing taxpayers to purchase a new $3.5 million digital scoreboard above center court at Conseco Fieldhouse as part of the $33.5 million give-away to the Pacers franchise by the CIB. Improved attendance is also boosting the Indians. The Indians drew 549,522 last season and are on a path to top 600,000 this year, surpassing total season attendance for Pacers games. Although the Indians' profit fell below $1 million last year, the team expects to top $1 million this year. I think the public would view public-private partnerships with sports teams a lot more favorably if they worked out as well as the City's positive relationship with the Indians has been and we're not constantly being pestered for more handouts and threats of moving the team elsewhere. Last night's vote for the transfer of ownership of the water and sewer utilities paves the way literally for the largest public works spending program in Indianapolis history. Financed with double-digit rate increases for utility users and hundreds of millions in new borrowing, the City of Indianapolis will begin spending close to a half billion dollars next year paving streets, building sidewalks and whatever other public improvements Mayor Greg Ballard and the Republican-led council think will buy enough votes and pay off all of the city contractors who have been bankrolling Ballard's re-election campaign to keep them in power for another four years. While these types of big tax and spending plans are what we've come to expect of Democrats, the Republicans seem to forget how the rank and file members of their own party feel about such spending boondoggles. Three Democrats, Jackie Nytes, Paul Bateman and Mary Moriarty Adams, all known for cutting backroom deals to feather their own nests, crossed party lines and supported the Republican vote-buying scheme, along with former Republican and now Libertarian Ed Coleman, who has proven to be the least effective member of the council repeatedly after bolting his party two years ago. Despite the fact that what few Libertarians there are in the county mostly opposed the big spending and hidden tax plan, the party's chairman actually put out a press release backing Coleman's vote to the bewilderment of many Libertarians. “This was a complicated deal and an important vote. We know Councilor Coleman carefully reviewed the facts and came to his conclusion after significant deliberation,” says LPMC Chairman Timothy Maguire. “After weighing all the pros and cons, we feel that this was the right move for Indianapolis.” Maguire goes on to say the plan simply corrects a mistake the City made in purchasing the water company several years ago. He then continued, “There are aspects of the deal that we wish could have been different, but we cannot let perfect be the enemy of good." "The Mayor’s Office and the Council will now be sitting on hundreds of millions of dollars and must use these resources wisely." So much for the Libertarian Party being more than an a mere echo of the worst of what our two party system has to offer. Marion Co. Democrats have made it be known the three might face challenges in next year's slating should they decide to seek re-election. "What does the future hold? ... It looks like as many as three Democratic City-County councillors -- Jackie Nytes, Mary Moriarty Adams and Paul Bateman -- could be siding with Mayor Greg Ballard when the council votes tonight on the mayor's ill-conceived plan to sell the city's water company to Citizens Energy Group," the Democratic Indianapolis Times blog wrote ahead of last night's vote. "It could make for an interesting party slating convention in February." Jackie Nytes has other problems. She is administering federal funds on behalf of the Mapleton-Fall Creek Development Corporation while participating in partisan politics in violation of the Little Hatch Act. Last year, Nytes' husband's business was awarded a lucrative printing contract from the cash-strapped parks department just weeks before she crossed party lines and supported the CIB tax, spend and borrow bailout plan. Ballard then awarded her CDC a million dollar grant less than two weeks after her vote. Adams is a county employee in the assessor's office and is married to a retired police officer. 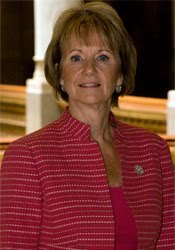 Her boss, Greg Bowes, is one of a number of Democrats vying to be appointed by Gov. Mitch Daniels to fill a vacant Marion County judge position. And Bateman is facing an investigation of whether he and others made off with more than a million dollars from a now-bankrupt nonprofit, the Russell Foundation. It's a pretty sorry lot that teamed up with the Republicans to pull off the biggest government scam in Marion County history for which Marion County residents will be paying the price for decades to come. Marion Co. Prosecutor Carl Brizzi detailed fourteen criminal charges against Shamus Patton, the 17-year-old who police say fired a gun and shot nine young victims downtown a little more than a week ago during an Indiana Black Expo event for teens as part of the group's Summer Celebration. All but two of the charges are felonies. Because one of the charges involve criminal gang activity, Brizzi explained the juvenile's case was automatically waived into adult court. Brizzi alleges Patton belonged to a gang known as the Ratchet Boyz and was shooting at members of a gang known as the Grimmie Boyz. A copy of the probable cause affidavit can be viewed on WISH-TV's website here. It is interesting that police had executed a search warrant against Patton in May during which it obtained evidence of his criminal gang activity. Police claim spent bullet cartridges found at the shooting scene were consistent with unspent cartridges recovered from Patton during its May search of his home. Police recovered fifteen spent cartridges in the same two crime scene where the nine youths were shot. An crime lab analysis says all of the spent cartridges originated from the same firearm. During IMPD's May search of Patton's home, a gun was discovered on his person in violation of state firearm laws requiring a permit and being of at least 18 years of age to carry a concealed weapon. Police found one unspent cartridge on Patton's person when he was arrested last week, but no gun was found on him. It is extremely disturbing that Patton had been arrested no fewer than nine times as a juvenile offender over the past two years but was still roaming the streets freely, even after the May search warrant by police turned up evidence of his criminal gang activity. Patton should have been locked up in a juvenile detention facility where he wouldn't have been able to commit the heinous crimes police now allege he committed. It is also disturbing that none of the victims' statements according to the probable cause affidavit seemed to know why Patton would have been firing at them. As I've said previously, our law enforcement and prosecutors failed us miserably in dealing with this troubled youth, in addition to his parents. Police and prosecutors need to rethink the way they handle juvenile offenders to stop them while they are committing less serious crimes before they have the opportunity to commit more serious crimes. UPDATE: Like father, like son? The Star's story on the charges today indicates Patton's father, Damon Patton, has been in prison most of his life. It started with a cocaine possession conviction and later elevated to armed robbery and attempted armed robbery convictions. His 35-year-old father is currently is the Westville Correctional facility for domestic battery. Indianapolis police said Richard Rawley, 59, faces a felony charge of operating a vehicle while intoxicated causing serious bodily injury and operating a vehicle while intoxicated, a misdemeanor. According to a police report, Rawley joked with an officer that he "stopped counting after college" when asked how many drinks he had that day, later admitting he had several beers. Officer Travis Williams was working near 16th Street at Rochester Avenue just before 6 p.m. Sunday when he was struck by a Ford Ranger pickup driven by Rawley, police said. Williams suffered severe injuries to both legs and was transported to Methodist Hospital in serious condition. His condition was upgraded on Monday to good. Williams has been with the department since July 2009. Police said Rawley's blood-alcohol level was 0.13 percent. Other news reports suggest Rawley administers the McGruff the Crime Dog campaign on behalf of the sheriff's office. If all goes as projected, the sale transferring the municipally owned utilities to Citizens Energy Group would give residents a break on estimated triple-digit rate increases over the next 15 years. If projections miss, residents would see their rates increase above those estimates to pay off hundreds of millions in debt for the sale. Which scenario plays out depends on whether Citizens, a local nonprofit trust, can follow through on cutting $43 million from the utilities' operations every year. That's something that can't be known until Citizens takes over the utilities and combines them with its steam, chilled water and gas operations in an effort to find savings. Past mergers, public and private, have had mixed success. Although Citizens leaders are confident they will achieve the cuts, they offer no guarantees . . .
"If we're wrong about the synergies, we recognize the ratepayers would have to cover those costs. There's no riskless transaction," said Chris Cotterill, Republican Mayor Greg Ballard's chief of staff. "We think that's a manageable risk." "A manageable risk" says Chris Cotterill, who won't even be around to answer questions for the utter costly failure that will most assuredly greet Indianapolis ratepayers. He'll probably be enjoyng his high-paid job he anticipates getting with his former employer, Barnes & Thornburg, for all the millions of taxpayer dollars he and fellow B&T employee, CCC President Ryan Vaughn, have helped steer to the firm in the form of legal work during the corrupt Ballard administration, not to mention the fact that Vaughn's firm represents Veolia, the private operator of the water utility that this deal forces Citizens Energy to keep intact. The past is prologue. Nobody can point to a single government merger plan of any sort in this county that has produced a dollar of savings over the past five decades. The only thing we know for certain is that Citizens is being forced to borrow hundreds of millions of dollars it plans to pass on to city ratepayers to fund a massive government works project Ballard and the Republican council want to fund ahead of next year's election to buy votes. City contractors have been lining Ballard's campaign pockets for the past three years and want their pay off and Ballard is all too willing to assuage them. There's a reason the Republican-led council rejected an amendment that would have forced Citizens to ensure rate mitigation as a result of the utilities transfer. They all know it will do the exact opposite. They're just having a good laugh at your expense that they managed to get the Indianapolis Star and the City's so-called "civic leaders" to buy into this massive fraud. UPDATE: The council approved the utilities transfer tonight by a vote of 19-10, with all Republicans, three Democrats and the lone Libertarian voting for its passage. As I've explained before, this proposal is a massive hidden tax increase on the people of Indianapolis perpetrated by our Republican mayor and Republican council. CCC President Ryan Vaughn steered its passage despite the obvious conflict of interest he has because of the financial stake a big client of his firm--Veolia--has in the deal. Libertarian Ed Coleman proves he is a phony politician who is completely lacking in principle by his vote tonight. As several have noted to me, Coleman is desparately trying to get back in good graces with the Republican Party after abandoning it a couple of years ago. Coleman will never have an opportunity to serve on the council again. Perhaps the best he can hope for is a new job courtesy of his support of this proposal. The three Democrats who voted for it included Jackie Nytes, whose CDC has been rewarded with more than $1 million in grants by Mayor Ballard and whose husband's printing business has been awarded lucrative contracts by Ballard's administration. Mary Moriarty Adams, another Democrat who voted for it, is a county employee. Councilor Paul Bateman, the final Democrat who voted for it, has been under investigation for his role in a now-defunct nonprofit organization. Bateman and others have been accused by a federal bankruptcy trustee of misappropriating more than a million dollars from the Russell Foundation. Like I've said on numerous occasions, city government in Indianapolis is every bit as corrupt as it is in Chicago. The only difference is that Chicago has a prosecutor who will hold the politicians to account for their criminal actions; Indianapolis does not. Big winner. Picture the leader of the free world, walking the family dog, Bo, on the White House lawn, the plastic bag in the pocket, like some perfect TV dad. He hears the news that Blagojevich has rested his case and won't testify or call any witnesses. And that's when — in my purely fictional mental tableau of the president waiting for Bo to do business on the lawn — Obama fishes into his pocket for a smoke and lights up. Our president takes a big drag, exhales with a satisfied sigh. Ahhhhh. Why is our president satisfied? Because with Blago cutting short his defense, Rahm Emanuel, Obama's chief of staff, won't be called as a defense witness to talk about how the Obama White House transcended the old broken politics of the past by haggling with Blago over the Obama Senate seat. As a lawyer, Obama would know that without a defense case, there's no way that the president's old real estate fairy, Tony Rezko, would come up as a prosecution rebuttal witness. "My man," he says, thinking of Dead Meat, as he looks to the west, toward Chicago, blowing smoke through that famous smile. Then he and Rahm enjoy some celebratory mojitos in the Rose Garden and toast Blago again. I reacted skeptically to Schlussel's take initially, but as the story of the Senate seat bargaining played out during Blago's trial, it clearly appeared from the evidence presented in the case that the Obama folks were in the game playing in typical Chicago political fashion. The timing of Blago's arrest indeed may have prevented the new administration from getting caught red-handed in the act, not that it stopped them from later trying to buy Senate seats in Pennsylvania and Colorado in this year's election buy offering candidates not of their choosing federal jobs. While so much of the criminal activity in which Blago was engaged as governor involved convicted political fixer Tony Rezko, who was actually much closer to Obama than he was to Blago, he was nowhere to be seen in the government's case against him. Instead, the government opted to use employees of Rezko for testimony. We know that Rezko has been cooperating with federal investigators since his conviction more than two years ago because the government has still not sentenced him in that case. As Blago's trial began, the feds quietly moved Rezko to a prison in Wisconsin instead of keeping him in the Chicago lock-up where he had been held. It looks to me like Fitzgerald actually took a chance on weakening his case against Blago in order to protect Obama from the obvious political corruption in which he was engaged. I still have a lot of respect for Fitzgerald, but it really bothers me that he may have rolled over for him in an effort to keep one of the highest profile prosecutor jobs in the country. Watching Democratic Rep. Brad Ellsworth's television commercials, Indiana voters might get the idea that he was a sheriff for 25 years. After all, Ellsworth himself says so in both his ads. Problem is, Ellsworth was only Vanderburgh County sheriff for eight years -- he was a deputy for the other 17 . . . The state Republican Party called Ellsworth's ad misleading and said it's another example of how Ellsworth is trying to gloss over his D.C. experience. "Clearly this is about Brad Ellsworth wanting to talk about anything other than his time in Congress and the votes he's cast there," said Indiana GOP chairman Murray Clark. "Apparently he is trying to be clever by overstating the amount of time he served as the elected sheriff in hopes that it will fill in the four year gap on his resume that he's spent in Washington." Ellsworth couldn't have spent 25 consecutive years as county sheriff in Indiana because term limits prohibit sheriffs from serving more than eight years in any 12 year span. 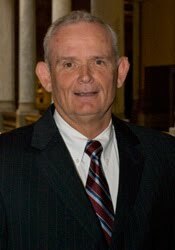 Ellsworth was elected as sheriff in 1998 and was elected to Congress in 2006. In his latest 30-second ad, which started running this week, Ellsworth tells voters about his background as he poses next to a sheriff's department vehicle. He's shown wearing a sheriff's uniform and walking down the street talking to people. "My 25 years as sheriff was all about putting other peoples' needs first," he says in the ad. "The U.S. Senate needs that same approach. Senators should be helping other people -- not just helping themselves like Washington always does." Ellsworth said in his first 30-second ad: "One thing that 25 years as a sheriff teaches you is zero tolerance for bull. There's too much at stake. But out in Washington it's like they live and breathe the stuff." Clark scoffed at that ad after it first ran earlier this month. "One thing that four years in Congress teaches you is how to spin a lot of bull," Clark said. Sometimes it’s so easy for candidates to get it right in their campaign commercials that you have to wonder why they get it wrong. This is the case of southern Indiana Democratic Congressman Brad Ellsworth, who is running for Indiana’s open U.S. Senate seat against Republican Dan Coats. Actually, though, Ellsworth served only eight years as an elected sheriff and the rest as a deputy. In fact, Indiana law prevents anyone from serving more than two consecutive four-year terms as sheriff. It’s a small thing. And it probably wouldn’t even be an issue if it didn’t seem as if he is basing his candidacy on being a sheriff and not a congressman. Ellsworth is trailing former Sen. Dan Coats badly in the polls. His campaign advisors may want to rethink their strategy and start running ads that come close to resembling the truth if they want his candidacy to be taken seriously in a year in which voters are viewing all politicians skeptically. Attempts by the Left and the mainstream media to cannonize Shirley Sherrod and their efforts to make you believe she is someone she so clearly is not continue unabated. In this video clip above, CNN's Anderson Cooper doesn't miss a step as Sherrod tells him Andrew Breitbart, the person who first publicized a portion of a video clip found on the NAACP's own website of her speaking at one of their events, is a racist who wants to make all black people slaves again. Right after she makes that unchallenged assertion against Breitbart, Cooper then asks her if she is considering a lawsuit against him for defaming her. Yes, she unbelievably says she is considering a defamation lawsuit against him. You also won't be surprised to see the Star's editor, Dennis Ryerson, jump on the bandwagon of bashing conservatives and cannonizing Sherrod in his Sunday musings on the editorial page. Ryerson complains that the conservative blogger and Secretary of Agriculture Tom Vilsack failed to check out the complete story before running with it. Perhaps Ryerson should practice what he preaches. Sherrod is so clearly a person who not only has not moved beyond race-baiting ways, but who is also engaged in typical class warfare politics the Democratic Party has come to embrace. UPDATE: Here's another clip below of Sherrod's speech to the NAACP. I don't know what to make of her comments about the health care debate. At one point she seems to be saying it's a debate over keeping the people with money in power. It then becomes a debate over Republicans fighting a black president. It's then a debate over race. Gee, Shirley, make up your mind. I thought the talking points on both sides of the issue hadn't really changed that much from when Hillary Clinton first pushed a government take-over of health care back during her husband's presidency until I heard Sherrod's comments in her speech. Is A Pattern Of Behavior By Simons Emerging? Herb Simon tells our Capital Improvement Board that his Indiana Pacers franchise is losing tens of millions of dollars each year. He demands the CIB pick up the operating and maintenance costs, along with the costs of new capital improvements on Conseco Fieldhouse, which he gets exclusive use of rent free and gets to keep all of the revenues, or the CIB might just see his team packing up and moving to another city. The CIB complied with Herb's demand and is gifting him $33.5 million for agreeing to abide by the long-term lease agreement he thought was a swell deal when the CIB agreed to build the new fieldhouse for him a little more than a decade ago. A few years ago, the Simon Property Group saw a need to build a new corporate headquarters. Unless the City gave up public park space across the street from the State House, free use of a city-owned parking garage and public incentives worth at least $25 million for its new headquarters, the Simon company might have to move its company headquarters out of town downtown we were told. Mayor Bart Peterson caved in to every one of the Simons' demands. And then there's this story in today's IBJ by Cory Schouten about a lawsuit alleging unfair business practices by Simon Property Group. One of Indiana’s largest privately held developers is suing Simon Property Group Inc., alleging the nation’s largest mall owner abused its “market power” to bully two national retailers into backing out of leases at a lifestyle mall near Mishawaka. An entity tied to South Bend-based Holladay Properties Inc. alleges in court filings in St. Joseph County that Simon used “anti-competitive tactics” to pry Ann Taylor Loft and Lane Bryant, committed tenants of its Heritage Square lifestyle mall, to open stores in the nearby Simon-owned University Park Mall instead. Holladay says Simon also tried unsuccessfully to persuade Coldwater Creek and Eddie Bauer to back out of lease deals at the 230,000-square-foot Heritage Square, which broke ground in 2006. In the case of Eddie Bauer, Holladay claims Simon CEO David Simon personally appealed to the retailer’s CEO to break the Heritage Square deal and open in Simon’s answer to the new Holladay-owned mall: a 100,000-square-foot lifestyle component added in 2008 to University Park Mall. It looks to me like there is a clear pattern emerging of how the Simons conduct their business affairs. Isn't it time the taxpaying public gave them a dose of their own medicine? Let's stop supporting their NBA team, their corporate give-aways and spending our money at their malls until they learn how to play fair. I don't know about you, but I've had my fill of this "Simon says, Indy does" routine. In a statement given to CNN, Facebook said a "note" by Palin about her opposition to building a mosque near New York City's Ground Zero had been deleted by an automated system. "The note in question did not violate our content standards but was removed by an automated system," Facebook spokesman Andrew Noyes said in the statement. "We're always working to improve our processes and we apologize for any inconvenience this caused." "No one is disputing that America stands for – and should stand for – religious tolerance. It is a foundation of our republic." "This is not an issue of religious tolerance but of common moral sense. To build a mosque at Ground Zero is a stab in the heart of the families of the innocent victims of those horrific attacks." "Many Americans, myself included, feel it would be an intolerable and tragic mistake to allow such a project sponsored by such an individual to go forward on such hallowed ground. This is nothing close to 'religious intolerance,' it's just common decency." It seems we've reached a point in this country where the steady drumbeat of criticism directed at people of the Christian and Jewish faiths is simply an exercise of freedom of religion and freedom of speech. But let someone say anything, no matter how sensible, that just one person complains about as being intolerance directed at the Islamic faith, even if it is simply an exercise in social experimentation by a Palin hater who has nothing better to do, then those fundamental freedoms must give way to censorship. I was standing inside the Steak & Shake at Ground Zero (Illinois and Maryland streets) at 9:30 on Black Expo Saturday night. Public Safety Director Dr. Frank Straub and I were waiting to order milkshakes, when we heard loud noises outside and screaming inside. Two people yelled “Duck.” I did. Straub headed for the noise and commotion. A few minutes later, I emerged from the restaurant into chaos. A young Black male lay wounded in the leg 20 feet from me as Straub and other officers tended to him and a younger wounded youth at the intersection. Police and volunteer faith based workers professionally did their jobs; and did them well. While Brown agrees it's not the organizers of Black Expo's event that the shootings occurred, he wasn't mincing words in holding them accountable for the continued violence that has plagued the second weekend of the organization's Summer Celebration. But, Indiana Black Expo bears some responsibility for creating an environment – both real and perceived – that Expo events are tailored more to pre-teens and teens; while families and adults are ignored . . . The crowd milling downtown Saturday outside and inside Expo was the lowest in many, many years. Though the violence outraged many, there’ve been shooting deaths downtown during past Black Expos – two incidents this decade, others in the previous two decades. What turned this incident into a white hot media and public frenzy was (1) the number of injured; (2) its brazenness; and (3) the fact that a TV camera was there when the bullets whizzed . . .
Again, Expo isn’t responsible for the shooting or even the societal conditions that would lead someone to such a depraved act. But, there is lots Expo must answer to and change in the organization’s most dysfunctional and controversial year. One final word on Expo. The big question last week was how would the Corporate Luncheon crowd respond when Mayor Greg Ballard received his award? Indiana Black Expo’s decision to give Mayor Ballard their most prestigious award rankled many in the African-American community. But Expo officials turned a deaf ear to community complaints. When the mayor was introduced, a handful in the crowd of some 2,000 stood and applauded. Most others sat in their seats, hands in laps. That pretty much sums up community reaction to the 40th Expo. Ouch. It looks like Ballard's strategy of hiring Olgen Williams as his deputy mayor, touting minority contracting opportunities that only benefit a few politically-connected businesses and pandering to a small group of black ministers by handing out crime prevention grants and other taxpayer money to them isn't building as much support for him in the black community as his political handlers seem to think. You would think after all these years Republicans in this town would figure out that such simple-minded approaches to win over support in the African-American community is getting them nowhere. U.S. Rep. Andre Carson ducked Human Events correspondent Jason Mattera's questions to him recently about his recent allegation that Tea Party demonstrators outside the Capitol bulding hurled the n-word at him and other African-American congressmen. At one point, Carson pretends to be talking on his cell phone to avoid addressing Mattera's questions. Carson claimed the racial slur was used at least 15 times despite the fact that numerous audio and video recording devices failed to pick up a single slur and countless eyewitness observers deny his claim. It was that claim that helped fuel a move at the recent NAACP convention to denounce the Tea Party movement for alleged racism. After first firing USDA official Shirley Sherrod for her obviously racist comments she made before an NAACP banquet earlier this year, the Obama administration apologized to her and offered her a new job at the Department of Agriculture after they say further video of her speech showed that her racist comments were about how she felt about not helping white farmers more than 20 years ago and did not reflect her views today. After all, she didn't just drop that poor white farmer's case; she referred him to "one of his own kind." It looks like the Obama administration should have looked at the entire video before it quickly reversed its earlier decision to can Sherrod. In the video above posted on Andrew Breitbart's site she practically begs black people to find jobs working for the federal government because they rarely get laid off from their jobs unlike people working in the private sector, even when they say insensitive and outrageous things like she said to the NAACP. Last night, Fox News' Bill O'Reilly also looked at partisan comments Sherrod made during her speech before this supposedly non-partisan, nonprofit organization that might put her in direct violation of the federal Hatch Act, the law that limits the political activities of federal employees. Before this is all over, the Left and, in particular the mainstream media, is going to rue rushing to the defense of Sherrod. Indiana's FSSA has decided to end a policy first enacted under the administration of former Democratic Gov. Frank O'Bannon that reduces state grocery benefits paid to persons with developmental disabilities if they also receive federal food stamps. Advocates for the developmentally disabled had argued in a lawsuit filed against the agency recently that the policy violated a federal law that prohibits the states from using food stamp benefits to reduce other benefits paid to recipients. The agency's spokesman, Marcus Barlow, said the lawsuit brought the issue of the 10-year-old policy to the agency's attention after the lawsuit was filed. Barlow says the new policy will be reflected in benefits paid beginning in the month of August. Under the current policy, Indiana reduced a disabled person's monthly grocery allowance as federal food stamp benefits increased so that state and food stamp benefits combined did not exceed $200. The state monthly benefit, however, will still remain capped at $200. It seems rather odd that it took advocates for the disabled a decade before they figured out the state policy violated federal law. It's even more striking that the policy was enacted by a Democratic governor. WISH-TV's Brad Edwards has a disturbing story about how a man convicted of attempting to kill two Indianapolis firefighters, who were working undercover back in the early 1990s on an arson investigation case, got released from state prison after serving only 15 years, notwithstanding his original 50-year sentence. Dwight Cobbs, a reputed member of the Haughville syndicate, opened fire on a car in which the two undercover firefighters were working (who he mistakenly thought were undercover police officers), leaving one of his victims partially paralyzed. Cobbs has been arrested again only a year after his release from prison for dealing drugs to an undercover police officer at a Kroger's store. This case just cries out for a truth in sentencing law. As Edward's explains in his report, 10 years of Cobb's original 50-year sentence was suspended. His sentence effectively was reduced in half for each day served, reducing his sentence further to 20 years. And then throw in five years for good behavior and he's out in 15 years. Unbelievable. The Senate campaign of U.S. Rep. Brad Ellsworth (D) released another "I'm one of you, not one of them" ads today. His message, however, is clashing with a competing ad paid for by the Republican Senatorial Committee, which is making its way around the Internet today for the benefit of former Sen. Dan Coats, showing Ellsworth during his recent trip to Vancouver, British Columbia to raise campaign cash from the trial lawyers. It was bad enough that Ellsworth would take a trip outside the country to raise money from a powerful Washington special interest group, you know, the ones he's supposedly fighting against for the common people; it's even worse that he wasn't able to do so without being caught in the act on video. 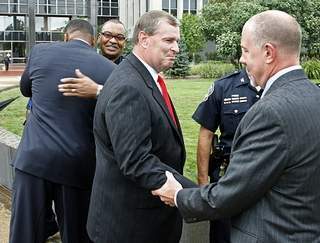 Today's Star had this photo of Mayor Greg Ballard, Public Safety Director Frank Straub and various law enforcement officers congratulating each other on the capture of 17-year-old Shamus Patton. He's the person suspected of opening fire during Saturday night's Black Expo Summer Celebration and shooting a total of nine young victims between the ages of 10 and 19 at two different locations before escaping a police net comprised of 500 police officers surrounding downtown. To watch these gentlemen patting themselves on the back at a press conference called to make the announcement of Patton's arrest you would have thought they had just captured Osama bin Laden. I for one think they should have all been holding their heads in shame for their failed leadership in the wake of this past weekend's milieu. Nobody should have been surprised at what happened this past weekend. Indianapolis residents have become all too familiar of the news that comes out during the second weekend of Black Expo. This year's shootings make five separate shootings that have occurred at Black Expo since 2006. Downtown business owners dread the coming of this event every year. What could otherwise be a profitable summer weekend with lots of out-of-town visitors becomes one of the summer's worst weekends. Out-of-town visitors and local regulars avoid downtown like the plague during the second weekend of Black Expo. Bar and restaurant owners complain that their employees don't want to work this weekend and fear for their personal safety. It got to the point a few years ago where a number of restaurants actually closed down. Business owners now say they have been ordered by the City to stay open during Black Expo or risk action being taken against them by the City, such as yanking their alcohol permits. Notwithstanding the ICVA's incredulous claims that IBE pumps $23 million into the downtown economy, I challenge you to find any business owners downtown who will back up that claim. Despite years of experiencing the same sort of violence and general mayhem during this event, Ballard, Straub and IBE's leadership professed shock at what happened and insisted it was isolated from, and had nothing to do with IBE sponsored events. Baloney. IBE lures a mob of unsupervised teen-agers every year to downtown this second weekend by promoting their Teen Bling event, the name for which itself arguably invites the worst elements of the community. When former Mayor Peterson turned his police force loose to crack down on lawbreakers a number of years ago, the African-American community rose up in protest. As a consequence, police have been ordered not to arrest anyone unless they are committing a serious or violent crime. This has only led to more violence. The Mayor's answer is to add more police officers to the point we now have more than a quarter of the entire police force assigned to maintain order during the event, an exercise that costs taxpayers hundreds of thousands of dollars annually. What good has that show of police force accomplished? Two separate shooters draw guns and fire on ten victims with police on foot, bikes and horseback and riding in police cruisers. Both shooters escape despite the enormous police presence, with one of the shooters remaining at large. Numerous eyewitnesses and surveillance cameras helped police quickly identify Shamus Patton as the chief suspect in the shooting of nine victims at two different locations. With the unwitting help of Patton's family members, police were led to him on the City's westside almost two full days after the shootings. The second shooting suspect, who waited to take his shot at his victim a full 90 minutes after Patton allegedly opened fire on his victims, has yet to be identified by police and is still on the streets. Frankly, I found nothing impressive about the work of police in capturing Patton. What this weekend's events proved was the ostentatious show of police force at the event did nothing to curtail the worst type of criminal activity from happening and failed miserably to lead to the quick apprehension of the shooters before the shooters had a chance to dispose of the weapons they used to commit their acts that could help link them to the shootings. Police were under orders to patrol the downtown so passively that would-be criminals accurately perceived they could commit heinous crimes in full public view with TV news cameras all around and escape without capture. In the case of Patton, he had particular reason not to fear the police. Despite numerous arrests over the past couple of years, including crimes ranging from disorderly conduct, intimidation and criminal trespass to resisting law enforcement, illegal possession of a handgun and evidence of criminal gang association, the 17-year-old was able to go downtown Saturday night armed with a gun. Based on his comings and goings over the past two years, we can assume he served no sentence in a juvenile detention center for committing numerous crimes. Either police or prosecutors, or perhaps both, have failed to deal with this individual with appropriate punishment, which led to him being on the street and having the opportunity to shoot nine young victims. Not surprisingly, Saturday night's shootings are being linked by police to criminal gang activity despite Straub's protestations to the contrary when he was first asked about that possible link during a press conference called on Sunday. Straub talked tough during yesterday's press conference about holding criminals responsible for the crimes they commit, but his answer to dealing with criminals is to deprive law-abiding citizens of their civil rights. We've got to get the guns off the streets he says. Straub is unapologetic in his support of a ban on handgun ownership. But for the Supreme Court waving the Second Amendment in his face, he would confiscate every handgun from every citizen, whether criminal or law-abiding, if he had it his way. With that option off the table for now, Straub's answer is to impose upon every one's civil liberties to roam about downtown freely without police interference, including those licensed to carry concealed weapons. He wants to enclose downtown with barricades and only allow persons to enter the downtown district during IBE and other events through police checkpoints after being searched for weapons. He calls this creating "safe zones." "By promoting a secure atmosphere with a safe zone, Straub said he hopes to divert fights from crowds of innocent bystanders," the Star reports. Straub's safe zone didn't get a ringing endorsement from the ACLU's Ken Falk. "I have the right to walk Downtown without being searched," Falk, legal director for the ACLU of Indiana, told the Star. "A plan like a safe zone, he said, is still subject to the Constitution if it occurs on public property." If downtown business owners don't rise up in protest for these planned safe zones for dealing with this problem, then they deserve all of the economic losses they will most assuredly incur if Straub's plan is implemented. Instead of removing the problem event from its downtown locale, Straub is simply pandering to the ones who brought about this problem in the first place and who are costing us hundreds of thousands of dollars in extra policing for an event that is known for welcoming only African-Americans, in sharp contrast to other ethnic, community and gay pride events that welcome all and don't require a massive show of police force. Straub's plan punishes innocent business owners, and it punishes the vast majority of Indianapolis residents who object to what this annual event is doing to harm our downtown. Now do you see what's wrong with this picture? Someone tell me where the leadership is in all of this. If the shootings that occurred Downtown last weekend had been tied to the Indiana Plumbers Expo, or one of a thousand other conventions, the follow-up discussion wouldn't be so difficult. We all respect plumbers, of course. But if their annual convention required hundreds of city cops patrolling our compact Downtown on a Saturday evening, and if shootings and fights and other incidents outside the convention had become all too common, we would question whether the plumbers expo was worth the trouble. But we're talking instead about Indiana Black Expo and its annual Summer Celebration. So any discussion about the monumental problems tied to it gets bogged down in the treacherous issue of race . . .
Tuesday morning, leaders from Black Expo, the city and several black churches called the media to the Downtown Artsgarden to talk about the future. They announced a plan to create a task force to see what could be done to prevent problems like last weekend's. I walked away disappointed, feeling that the fear of hurting Black Expo was getting in the way of a meaningful conversation. Everyone wanted to separate the violence from the Expo. Or convince people that the shootings were an aberration. Or broaden the problem to include other big Downtown events . . .
We have to ask whether the current Expo leadership is up to addressing the problem. We have to be willing to acknowledge that these types of problems have not been associated with other conventions. We have to ask about the expense to taxpayers of securing the event. And we have to ask why this city buckles in fear of offending the National Rifle Association, so much so that it has refused to aggressively tackle the deadly issue of illegally possessed guns. In a statement after the shootings, the mayor insisted the gunfire did not reflect on Indianapolis. That's like a man saying his affair does not reflect on his marriage. Incidents such as this one define cities. That's why this city has to be willing to have an honest conversation. If you want to read more silliness in the Star about a task force to look at the issue, click here. We know what the solution is. It's too bad nobody in this community has the fortitude to lead the way. If Kansas City Can Do It . . . .